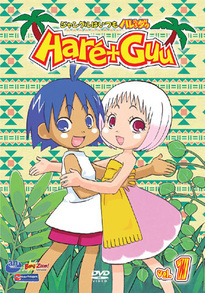 Ten year old Haré enjoys a peaceful life of school, video games, and households chores until his mother adopts an orphan girl named Guu, a girl who's not exactly what she seems. The insidious Guu turns poor Haré's life inside out when she reveals that she's actually a pan-dimensional, mind-reading, magic using monster with a sarcastic wit, an unlimited appetite, and a taste for driving Haré insane! Fluff up your chest hair, hide your elephants, and prepare yourself for more comic insanity that you ever imagined could fit in a single DVD.